The name of the restaurant describes it all... they serve food in super-sized portions! 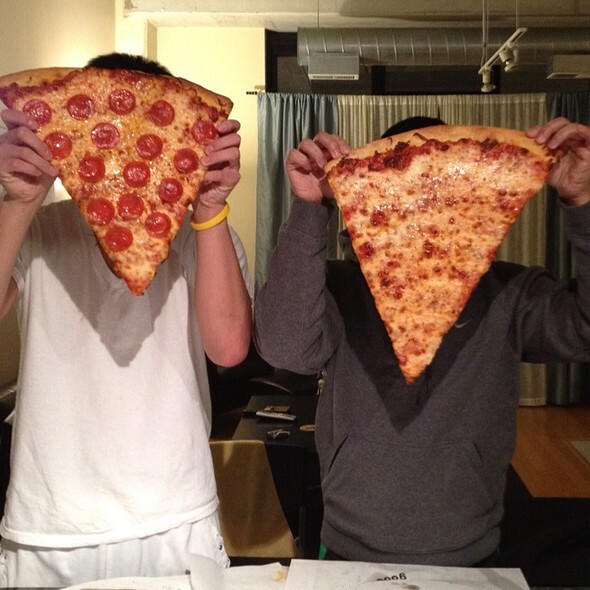 Just see the picture below to see the huge slices of pizza... literally the SIZE OF YOUR HEAD! I especially enjoy coming here later at night rather than having it for a meal. Seeing a picture online, I was first skeptical on how big the slices of pizza really could be. And when getting to the restaurant, it didn't seem that big... They have two slices, big and bigger ($5 and $8, respectively). We both opted for the bigger slice and waited as they warmed it up in the oven. I had pepperoni which made the pizza a little too greasy for my liking and my roommate had the cheese slice. We had it to go and we knew the slices were big when they used custom "to go" boxes. Anyway, the pizza crust was crispy but there was just too much grease on top of the cheese... napkins may be used to dry off some of that grease. The crust though had more flavor then the other large pizza places but overall, I still consider them to be all similar... places to grab pizza after a night of drinking. - Do order the bigger slice if you want to be blown away by sheer size. - Do look for a groupon... this place is frequently on Groupon Now and it makes it much more reasonably priced! - Don't expect this to be the healthiest pizza!